Twain’s pessimism has done little to deter the Mississippi River Commission. Since it was created in 1879, this division of the U.S. Army Corps of Engineers has waged a prolonged campaign to control the river. Their weapons in the battle are levees, dams, spillways, dikes, weirs and other pieces of infrastructure. Their mission is to prevent the river from abandoning its current course. Left alone, nature would probably send the Lower Mississippi River whipping back and forth across a 200-mile arc every few thousand years. Like “a pianist playing with one hand,” is how John McPhee described the river’s restlessness in a story for The New Yorker. With the main channel flowing unusually far to the east in its current configuration, the Mississippi is primed to snap back toward the west. Such a change would send most of the Mississippi’s flow into the Atchafalaya River, a distributory (the opposite of a tributary) of the Mississippi and Red Rivers. Such a change would pose an existential crisis for port cities like New Orleans and Baton Rouge, starving them of the water that has come to define them. By the 1950s, it was clear to the Army Corps that the great river was beginning to shift, as the amount of water escaping from the Mississippi and flowing into the Atchafalaya River had increased from 10 percent in 1850 to 30 percent in 1950. In 1953, the Army Corps came to the conclusion that the river would change course by 1990 if left unchecked. Since the 1950s, the Corps has worked to preserve the status quo. 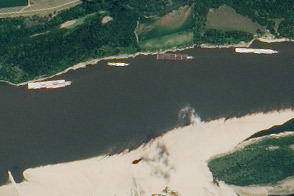 This series of satellite images acquired by the Operational Land Imager on Landsat 8 offers a view some of the key pieces of river control infrastructure used to manage the Lower Mississippi. 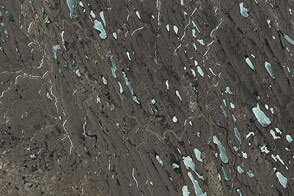 In these false-color images, water appears blue; vegetation is green; bare ground and urbanized areas are pink, gray, or brown. The image at the top of the page is a mosaic of six scenes acquired in February 2014. The broad view helps illustrate the relationship between the Mississippi and the Atchafalaya. 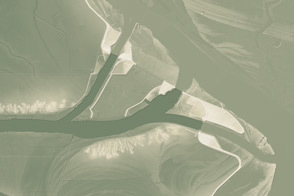 While the present course of the Mississippi River brings it southeast of New Orleans, the sharp oxbows at several points along the river show how abruptly it could alter course. The white detail boxes show some of the key pieces of infrastructure that the Army Corps has built to control the Mississippi and protect communities from major floods. 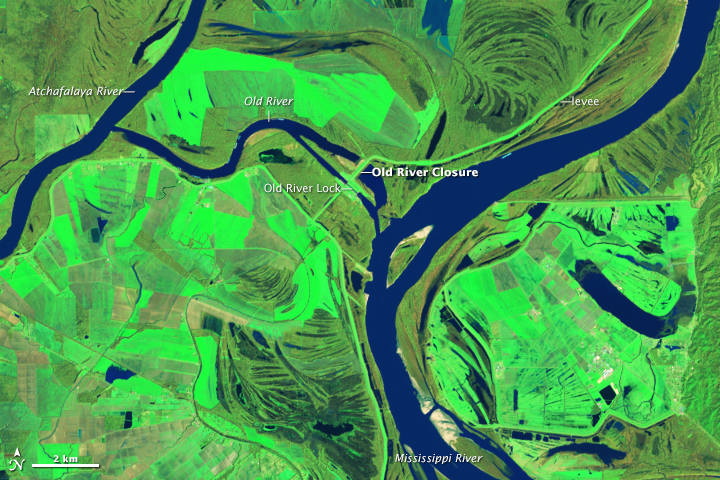 The northernmost box (see above for detail) shows part of the Old River Control Structure, a collection of levees, locks, floodgates, and canals that prevent the Mississippi’s water from shifting westward to join the Atchafalaya. Old River Control is designed so that 70 percent of the Mississippi’s flow continues to the main channel and only 30 percent flows in the Atchafalaya. 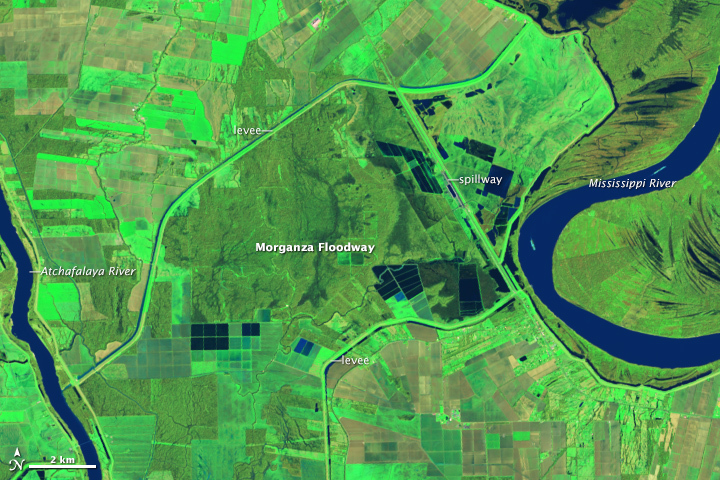 South of Old River Control is the Morganza spillway (see above for detail), a flood control-structure that shunts water into the Atchafalaya during extreme floods. Since the Army Corps built the floodway in 1954, it has only been used twice—in 1973 and 2011. 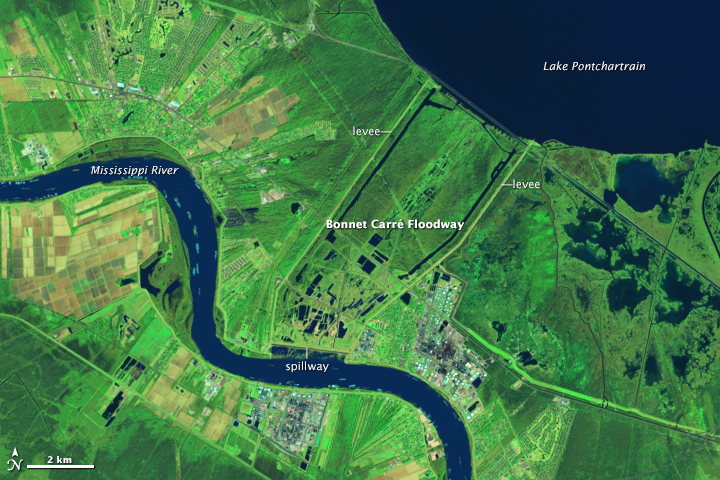 Another major floodway, Bonnet Carré, (below) is located just east of New Orleans. 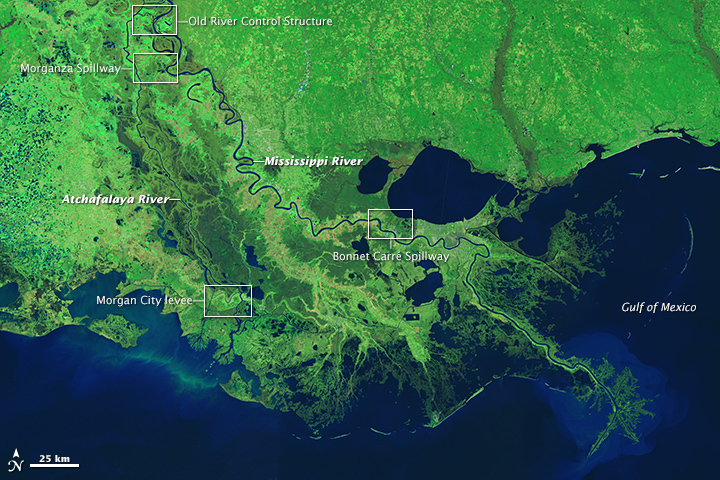 During major floods, it diverts water from the Mississippi River into Lake Pontchartrain. Bonnet Carré has been opened ten times since it was completed in 1929. 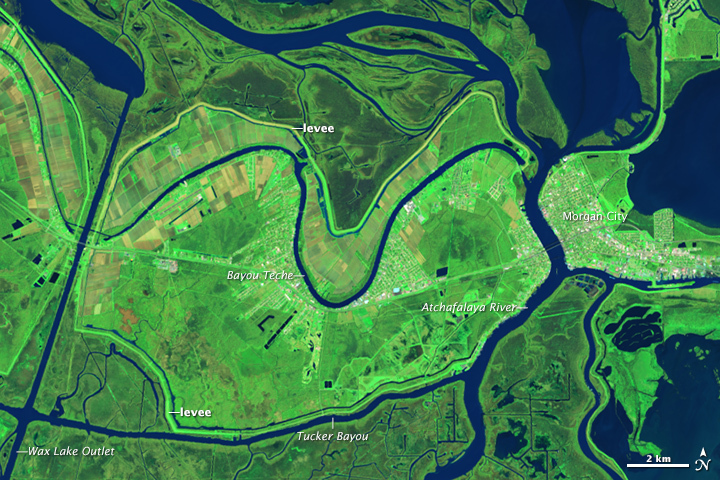 The final image (below) shows the fortress-like levee system that protects Morgan City, Bayou Vista, and Patterson, Louisiana, from floods on the Atchafalaya River. While all of the infrastructure keeps the Mississippi navigable and helps protect communities during floods, it comes with a downside. Prior to major river engineering, the combined Mississippi-Atchafalaya River system transported an average of 400 million metric tons of sediment to coastal Louisiana each year. Today the average is more like 170 million tons, a 60 percent drop. This dearth of sediment has contributed—along with sea level rise and subsidence—to a widespread loss of land in coastal Louisiana. According to some estimates, the size of the Delta decreases by approximately a football field worth of land every 48 minutes. Over the last 80 years, the delta has lost nearly 5,000 square kilometers (2,000 square miles), an area nearly the size of Delaware. 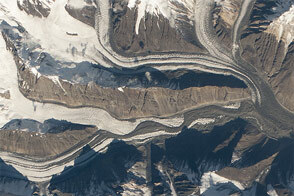 NASA Earth Observatory image by Michael Taylor and Adam Voiland, using Landsat data from the U.S. Geological Survey. Caption by Adam Voiland. Engineers use levees, floodways, dams, and much more to control the ever restless Mississippi. McPhee, J. via New Yorker (1987, February 23) Atchafalaya. Accessed March 17, 2015. ProPublica (2014, September 3) Losing Ground. Accessed March 17, 2015. Twain, M (1883) Life on the Mississippi. (Project Gutenberg: 2006). Accessed March 17, 2015. US Army Corps of Engineers Mississippi River Commission. Accessed March 17, 2015. US Army Corps of Engineers National Levee Database. Accessed March 17, 2015. 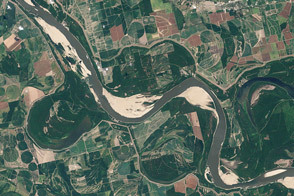 US Geological Survey A Brief History and Summary of the Effects of River Engineering and Dams on the Mississippi River System and Delta. Accessed March 17, 2015.